The TD bank: What Now? Editor's Note: Special thanks to readers of The Walkerville Times who raised their voice to the powers that be in City Hall to save the historical Dominion Bank building. One block at a time: the tedious task of dismantling the old Dominion Bank building at Riverside and Ouellette, the last vestige of the razed Norwich Block, is due to be completed in March. Once taken apart, the bank's facade will be stored for an uncertain future. The fate of this landmark is in the hands of a steering committee composed of community members, including the Windsor Architectural Conservation Advisory and the Architectural Conservancy of Ontario. The Dominion Bank Building Reuse Committee held its third meeting in December and will meet monthly every second and fourth Wednesday at City Hall. Steven Bezaire, the committee chair, says the main order of business is to establish criteria ranking submitted future use proposals. The job to assess these proposals will be done on a basis of agreed to committee criteria. "One criterion could be the extent to which the façade will be located close to its original site - this is very important to some business members," says Bezaire. "Another criterion could be how close the building is to the downtown core, or whether it is on a corner setting." Bezaire says the committee has brainstormed between 15 and 20 different criteria and are ranking them in accordance to significance. The City of Windsor Council members have voted to save the facade of the Old TD Bank. The historic Norwich Block will be razed, but the bank will be taken apart. It is still unclear what exactly will happen with the bank's facade- but the good news is that it will be saved. Take a good look at the photo on the above; this is the corner of Riverside Drive and Ouellette Avenue looking west in 1912. Downtown Windsor once featured splendid turn-of-the-century architecture. As we approach the millennium, it is almost all gone. 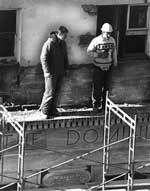 The city has completed the process of expropriating the Norwich Block; the last occupants will soon move on. Few of us will shed a tear with the demise of most of the buildings in this block. 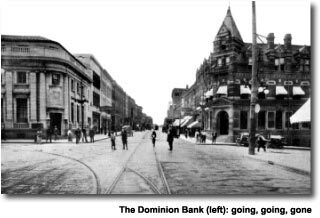 But one gem, The Dominion Bank, has a special place in Windsor's architectural history. Built in 1909 by renowned architects Carrere and Hastings, this elegant Beaux Art style building is the last marble structure in Windsor. As of press time, there's hope that the bank will not be torn down. The plan is to carefully deconstruct the facade and store it for some future consideration. Suggestions include replacing the 50's era Welcome Centre in Dieppe Park; filling in the hole adjacent to the Hilton on Riverside; or, incorporating it into the structure of a new Windsor museum. The Walkerville Times supports the preservation of this historical landmark. Leaving the bank where it is to form part of the future Chrysler Building would have been the ideal scenario. Since this is not to be, The Times endorses incorporating the facade into a new museum. Walkerville gets our vote as the location. If not for associations such as the ACO and concerned individuals, our history would only be found in books.